This is the most complete survival-kit / emergency kit for its size available on the market, with more than 40 essential items to see you through every conceivable survival or emergency situation. Includes premium TACTI-GLOW black firecord (additional core of jute tinder), red LED lamp, quality compass, light sticks, fishing equipment, reflectors, firestarter, tinder, tinder extender, whistle, water carriers and filters, ranger bands, first aid kit, morale boosters and much more. Small, convenient and portable to carry: Slightly larger than the traditional Altoids tin size. Keep it in your backpack or bug out bag, car glove box or a small pouch. Fantastic design: Unique gift for anyone interested in camping, hiking, hunting and survival gear. MADE WITH PRIDE IN THE UK. A fantastic gadget for Bear Grylls & Dual Survival fans! THIS IS THE MOST COMPLETE KIT AVAILABLE ON THE MARKET. 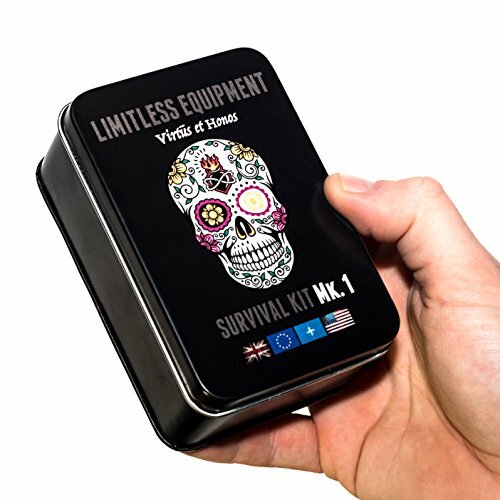 MADE WITH PRIDE IN THE UK BY LIMITLESS EQUIPMENT: SUITABLE FOR SURVIVAL TRAINING, PREPAREDNESS, EDC, ADVENTURE AND MILITARY USE. Contains 2m of TACTI-GLOW reflective firecord paracord. This is a versatile cord by Limitless Equipment with an added core of waxed jute tinder. Tinder extender in vial: Add to tinder for extended flame life in windy conditions. First Aid kit: Gauze pads (8×6), cleaning, wound dressing, tinder etc. X 1 Tampon: Tinder. Wound dressing. Etc.